Like most people do this time of year, I’ve been working on my goals for 2018 – both in my business and in my personal life. And I’ve been coaching some of my business students on how they can lay out a breakthrough year in their businesses. This got me thinking about how I always use certain parameters or tips each year to boost both my business and my personal goals. 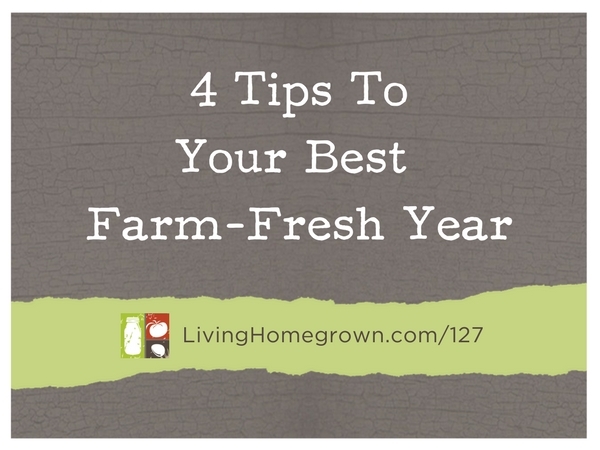 And I realized these tips would probably be helpful to you too – especially if you’re looking for growth in your farm-fresh lifestyle. It doesn’t matter if you are a goal-setter type or not. And that’s because these tips are NOT really about reaching every single goal. They’re about seeking a life that is richer and more fulfilling. The cool thing is…they only require small shifts. But those small shifts can have a big impact on your year ahead. For 2018: I will spend more time on the things I want to do! That sounds GREAT Cindy! So glad you are planning on that. I love that Karen. A whole quilt in just 10 min a day. Perfect example. Thank you for sharing that! I LOVE the podcast- but when you mentioned taking even just 10 minutes a day to work on a goal we had for the new year… The lightbulb went ON! I’ve taken it to heart, and have even set a reminder on my phone for a specific time in the day- and it’s been SO HELPFUL! Thank you for all your wisdom you share- we all have some to give… but we don’t all give it. Fantastic Heather. I’m so glad that tip is working for you!